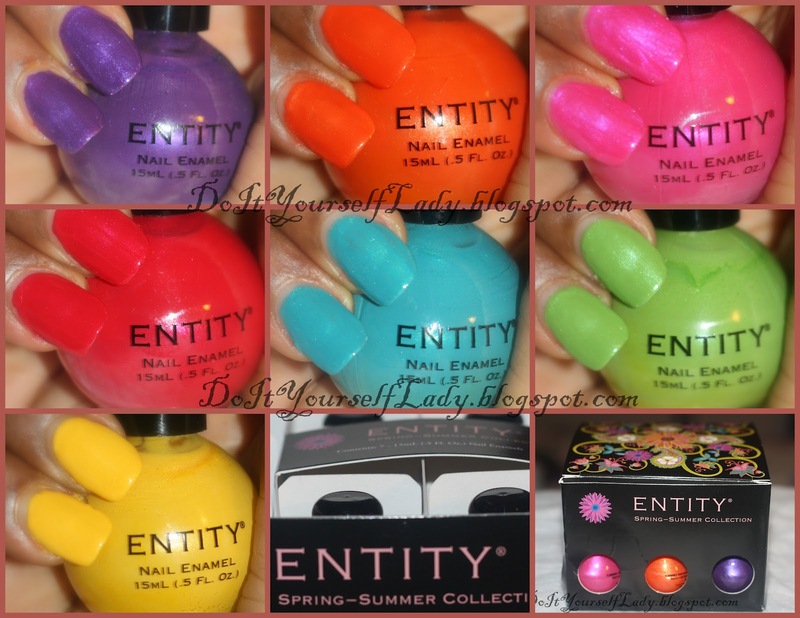 Today, I've got swatches, review and some nail art I did with Entity Nail Enamel's Spring/Summer Collection! Before I get to that though, I must say, My Opening Lines crack me up!! "What it do Sugars?"! Do y'all love me calling you sweet names?! Lol.. I think it's because of all the colorful polishes I've been swatching lately! I love color and that's truly one of the things that make my polish hobby enjoyable to me. The Polishes I got from Entity's Spring/Summer collection Came in a beautiful box! I couldn't help but to take a picture of it. Here's what the box looks like. The Design on the top is so gorgeous!! To view swatches, read reviews, and see the nail art I did with this collection, Please click Read More below. 7 Polishes came in this collection, and here's a collage of them all. And now, Close up pictures and review. All polishes were swatched without topcoat because I like to show you the true finish of each polish. They are 2 coats each unless otherwise stated. The first is this purple Polish Called Pearl Violet. I have a weakness for purples. So even though I believe I already have something similar to this in my stash, I was happy with this color. Formula was almost a one coater, but I used two for good measure. Next is called Pearl Orange. This one has micro gold shimmers in it that my camera didn't pick up. Lovely orange Polish for summer. The Gold really shimmers under light and I'm sure it'll be blinding in the sun! Would love to wear this one by the pool or beach! Then Peal Fuchsia. Sweet Pink. I am actually glad to say I don't think I own anything like this. The silver flashes you see in the bottle actually transfers on the nail, and I am tempted to call this a duochrome polish. Love it! And what's a summer a summer collection without a red? This is called Pearl Red. This looks like the right Polish to use when doing nail art that involves watermelon. Perfect color for toes!! I can see me doing so many Pedis with this one. I've said it time and times again... Blues are suddenly becoming my faves! This is called Pearl Turquoise and although it doesn't jump out as Turquoise to me, it's still a gorgeous blue. This color is not a "new color", but come on guys, can one ever have too many blues? Next up is this green. The tag at the bottom of my bottle is no where to be found, But I'm sure it'll be safe to say it's called Pearl Green. LOL!!! Ok, I should google this... *googled*.. I told you! It IS called Pearl Green. lol.. I crack myself up y'all! Not much needs to be said about this... It's green, it's pretty, it's summery! And Lastly, a Yellow Polish called, You guessed it... Pearl Yellow! The formula on this one was not the best. I had to use 3 coats to get it to be even and look like this. I love the color though! I'm sure two coats would have been enough if I was going to use topcoat. I Love the bottle shape and Overall Presentation of this collection. The box they came in is so pretty!! Formula was lovely for all of the polishes except the yellow. But we all know that this is common with most yellows. Careful application and topcoat would remedy this problem. These Colors are bright and very appropriate for the seasons they were created for. Spring/Summer. I do however feel that I have polishes similar to a couple of these in my collection. My Favorites are Pearl Pink, Pearl Violet, Peal Red and Interestingly, Pearl Yellow!!! Thumb to Pinky: Pearl Orange, Pearl Turquoise, Pearl Red, Pearl Yellow, and Pearl Fuchsia (All with topcoat). And then, I brought out my striping tape. Remember I said I was going to try more intricate designs with them? Well, it was time for practice, so I did whatever came to mind. I had no goal, because this was just practice. I'm proud of myself, but I have to keep practicing. Click Here to Visit Entity Beauty's Website. Click Here for an Entity distributor in your area. That's it for now darlings. Are you ready for summer?! Great collection! I love the mani you did using the striping tape! Great work with the striping tape! Looks great! I've yet to try striping tape mainly cause I can't find it anywhere! I admit, I like the box and the bottles, too! :) I was glad to hear a little more about Entity, too, because I'd seen them on one website, but didn't know much about them. Nice tape mani! I think it looks pretty awesome! The bottles are so cute too! I love skittle manis and your taping design looks amazing! I love the box this set came in too! The purple shade is definitely my favourite and oh wow, I love your tape manicure! It is so beautiful! How did you manage to do that? Love the colour blocking manicure! It looks really good. Those are gorgeous! Love what you did! That packaging on the box would get me to buy alone! I need to try this brand. Glad some of y'all love the packaging too. Wow, so pretty. Not sure about the streakiness but I do like the bottles and packages a lot. Your mani is killer! oh my goodness! hey I put up pictures of regular boxes on my blog so...I think you're definitely fine being pleased with such a pretty one! I def. would've included it. love the design you created with them! omg i LOVE them theyre so prettyyyy!! ahha i want that pearl orange ahhh so prettyyyy i love the skittle mani its so perfect for summer!! and i love the design you did with the stripes it looks good!